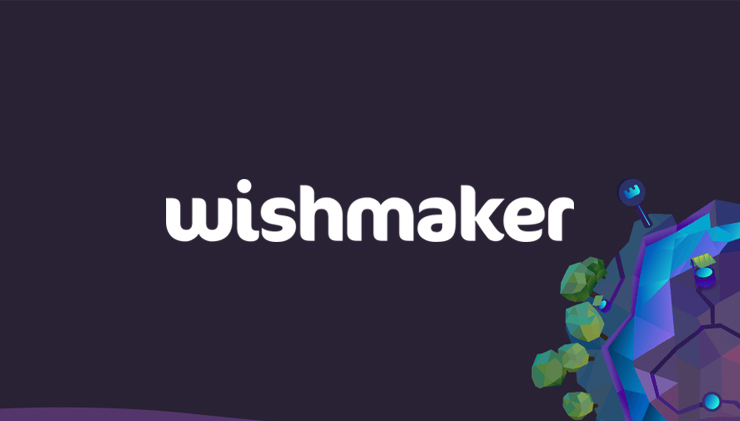 Wishmaker Casino Review (NEW 2019) | Careful What You Wish For! Note: Wishmaker.com doesn’t accept players from the US. So be sure to check out award-winning casinos like Roaring 21 and Cherry Jackpot instead. A casino with more than 1,500 state-of-the-art games and where real fans can claim bonuses that money can’t buy. Well, at least that’s the plan. But even as it is right now, it’s a hot new gamified casino made by people who know what it takes to smash the competition. So if you like online casinos that are full of features, player-friendly, secure and offer unique perks, then this Wishmaker review is for you. T&C: Bonus type: sticky. Deposit €/$10 or more and get a 100% match bonus up to €/$50 and 50 Free Spins on Reactoonz over 5 days. Max win withdrawal limit on Free Spins: €/$100. Wagering requirements: 35x on bonus amount and on Free Spins winnings. Game weighting and restrictions apply. New 18+ customers only. Full T&C apply. 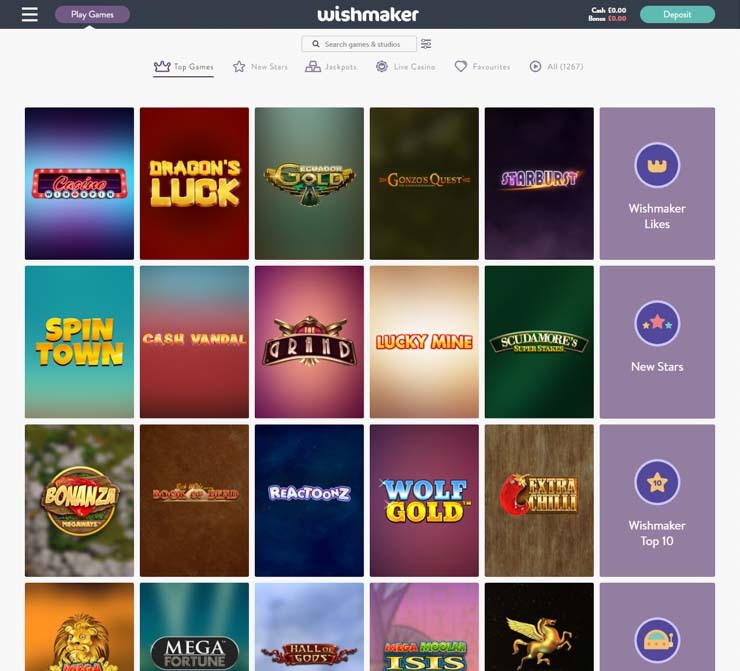 Wishmaker launched in December 2018 on the GiG platform, among Rolla, Dreamz, Ikibu, Rizk and Guts, so having the same big software engine under the hood means there’s also a lot going on at this new and shiny casino. Outstanding design and attention to detail. Essentially, Wishmaker feels like a game within a game. Whoa man! Now, let’s extract what’s in this genie’s lamp and talk about the bonuses, payments and see if the rewards are actually worth it in the full casino review next. 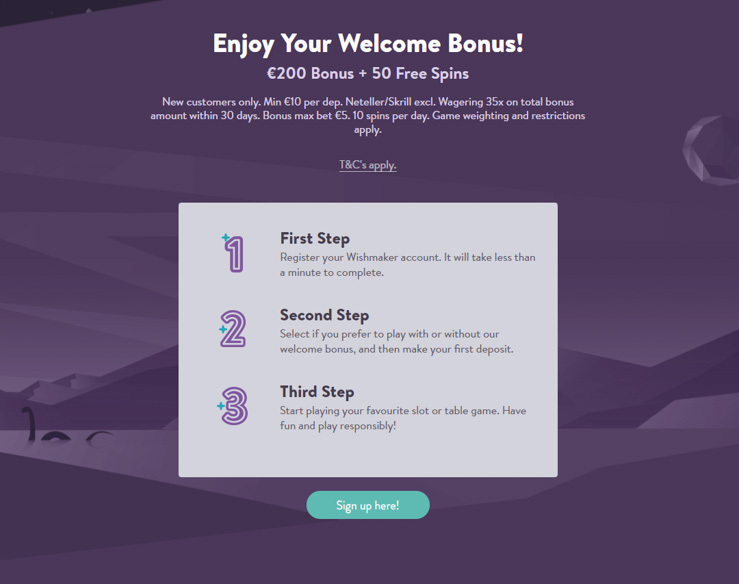 The casino has different new player bonuses depending where you live. Here’s what’s in store for players from the Netherlands, Malta, Ireland, Iceland, Luxembourg or Switzerland. This is a 100% match bonus, so even if you deposit just €/$10, you’ll get a €/$10 bonus on top plus 50 Reactoonz Free Spins over 5 days. Then on the 2nd deposit, you can claim another 100% match up to €/$150, for a total of up to €/$200 with spins over two deposits. *Max win withdrawal limit on Free Spins: €/$100. Wagering requirements: 35x on bonus amount and Free Spins winnings. Bonus type: non-sticky only in the UK. Game weighting and restrictions apply: slots: 100% (with exceptions), table games 5-10%, live casino 15%. Bonuses cannot be claimed by using Skrill or Neteller. Max bet with bonus: €/$/£5 or €/$/£50 per line. Here’s how you need to know when making that first qualifying deposit. Fast localised payment methods at no extra cost. This online casino caters to players from around the world, so there’s about 15 payment methods to choose from. This includes Visa, Mastercard, Trustly, Neteller, Skrill, Paysafe, Instadebit, iDebit, Euteller, Citadel, SOFORT/Klarna, ecoPayz, Entercash, Zimpler, Siru. There’s no PayPal nor iDeal though, and players in Sweden will enjoy instant bank withdrawals thanks to BankID aka no-account feature. Others won’t have to wait long as cashouts are usually processed within 24h for verified customers, at no extra fees. EU players will enjoy tax-free winnings thanks to the Maltese license, which complements two others: UK Gambling Commission and Swedish Spelinspektionen. Responsible gaming settings like deposit limit and session limit are all within easy reach and can be set up for your peace of mind within seconds, which is great. When you’re done with that, it’s time to play! 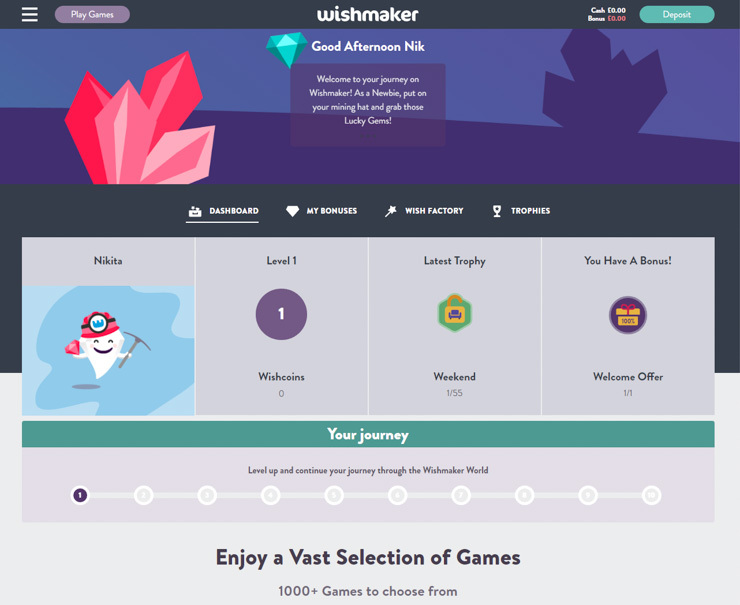 Over 1,000 games to choose from at Wishmaker. Wishmaker is a big modern casino. It has over 1,500 games from 22+ developers, including NetEnt, Big Time Gaming, Play’n GO, Yggdrasil, Microgaming, Evolution Gaming, Quickspin, Thunderkick, WMS, SG Digital, IGT, NYX, Bally, Push Gaming, ELK Studios, Red Tiger, No Limit City, Barcrest, Shuffle Master, Betsoft, Aristocrat, Merkur. The good news is that they have game filters that will save you a bunch of time and help find games by bonuses, themes and more. These ready-made categories are also available on mobile, right next to the search tab. You can also use that to sort out table and card games. You’ll easily find video poker, blackjack, roulette and baccarat. 👍 Tip: Use their helpful guides on playing online slots and table games, including blackjack, baccarat and roulette. Wishmaker Live Casino features premium tables from Evolution and NetEnt, including VIP tables and other live games like Dream Catcher and Lighting Roulette. Featuring live croupiers from Evolution and NetEnt. Okay, so what was that game within a game thing all about? 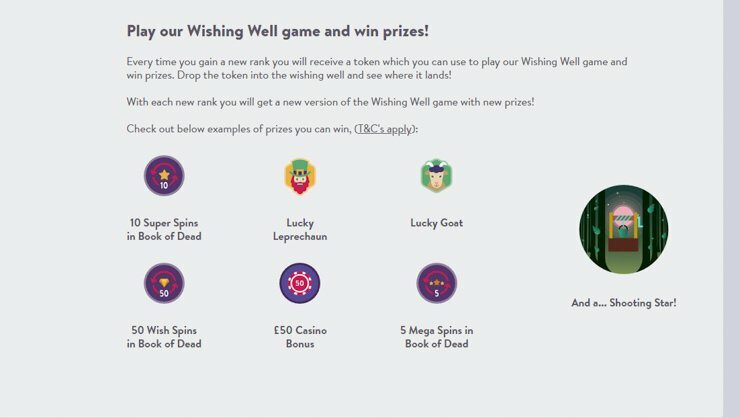 Wishcoins and Lucky Gems – What are They? Win or lose, Wishmaker keeps track of your activity. And one thing you get is Wishcoins. This is basically casino credit that you can trade for Lucky Gems. These come in different shapes and values, so you need to collect 3x of the same value to get a reward (free spins, cash, etc.). 👍 Note: Lucky Gems are also awarded each time you level up. And the place where you get that reward is the Wish Factory. Wish Factory – How to Get Money-Can’t-Buy Prizes? Buy anything from bonuses to exclusive experiences (coming soon). Wish Factory is a bonus shop. Trade Lucky Gems for casino bonuses. Currently, these bonuses are limited to valuable Super or Mega Spins and casino credit, but you’ll soon be able to find exclusive prizes that are either very expensive or basically impossible to buy in real life without the right connections. Players will soon also be able to donate their Wishcoins to a participating charity of their choice, which is a nice touch for good causes. To make it even more complex, there’s a Wishing Well side game! Win guaranteed prizes on the Wishing Well game. To play the Wishing Well you need a Wishing Well token which will be displayed in “Available bonuses” section in the player dashboard. There are 7 different guaranteed prizes: 3 different free spins prizes, 3 different Lucky Gems and cash. And these increase in value throughout the gamification journey. You need to reach level 2 to be get your first token, and then evert 10 levels. Fancy a try at Wishing Well? – Make a deposit and reach level 2 to unlock it! Easily keep track of your Wishmaker journey. Last but not least, Wishmaker will also reward you for various activities and ranks with special Trophies. Some of them will have different values like free spins and bonuses while others are only for collecting purposes. Does Wishmaker Casino have a proper VIP program? There’s none to be seen, but yes, they claim there is one specially developed to cater to those who seek the biggest and the best. It’s by invite only. While they won’t make your wishes come true, Wishmaker’s customer service department will certainly be of help, and it’s within easy reach also. You can contact them directly via live chat or email, 9am – 1am CET, Monday to Sunday. They speak English, Swedish, Finnish, Norwegian, and German. How good is Wishmaker’s customer support? Customer support is currently outsourced until they build their own in-house team very soon (based on insider info). These guys should know better how important customer service is, so chances are you’ll be taken good care; but don’t hesitate to send your feedback. Easy peasy (ROW bonus example). 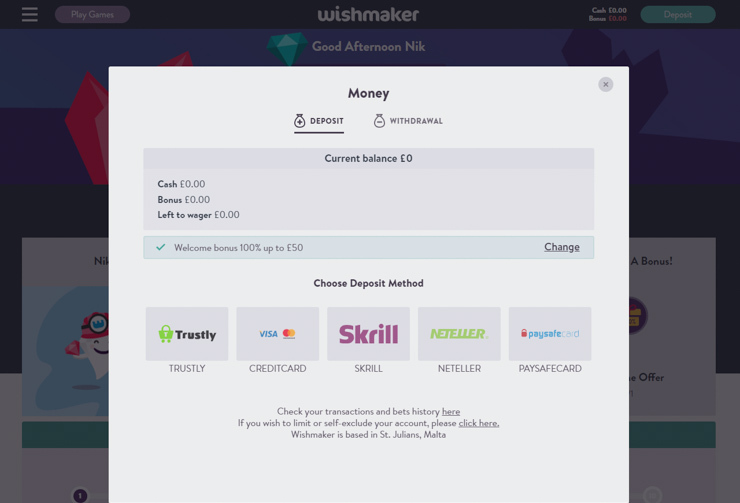 Despite the fact that all this gamification may seem disorienting, Wishmaker is actually very good at explaining how these bonus features work, as well as honest and transparent about any terms and conditions. So, unless it’s too much to your taste and you prefer simpler casinos like Fun Casino or Karjala, then before you know it you could be popping them Wishcoins like a pro. Welcome bonus – double your first deposit and get bonus spins on top. Banking – over 15 payment methods worldwide, at no extra cost and fast cashouts. Gamification madness – play and get casino credit to spend in the Wish Factory for exclusive bonuses or charities. Games – play more than 1,000 games from 22 top developers, including useful game filters. Customer support – accessible daily in 5 languages. 📌 Verdict: Wishmaker is one of the best white label casinos out there right now, and that’s even before they launch what promises to be one of the wildest reward campaigns in the online casino history. So, be careful what you wish for – it just might come true! 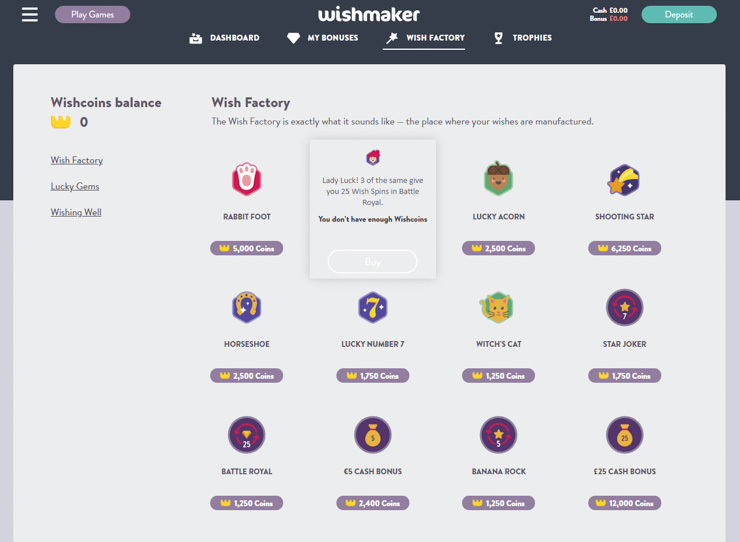 🧞‍♂️ Wish me luck: Visit the new Wishmaker Casino. What do you think of it? Leave your honest thoughts about it in the comments below and don’t forget to give it a star rating above for a fair score as well! Hi, I’m Nikita, the founder and editor at this site. I will help you find ideal mobile slots on the right online casinos. I have 6 years of iGaming experience and I’m here to share it all with you. Enjoy the review! T&C: Deposit €/$10 or more and get a 100% match up to €/$50. Bonus type: sticky. Max win withdrawal limit on Free Spins: €/$100. Wagering requirements: 35x on bonus amount and on Free Spins winnings. Bonuses cannot be claimed by using Skrill or Neteller. Max bet with bonus: €/$5 or €/$0.50 per line. Game weighting and restrictions apply. New 18+ customers only. Gamble responsibly. Full T&C apply.